Now that we’re almost to the end of the year, where many look back at the previous twelve months to find lessons to learn and apply in making their New Year’s resolutions, what can we learn from history where the U.S. national debt is involved? One point that stands out is that the years of dramatic reductions in the ratio of debt to GDP were years in which the United States ran primary surpluses. 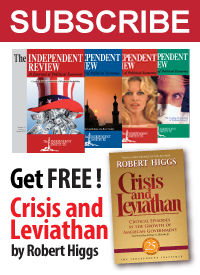 The only other chapter in history where the debt to GDP was reduced was the Inflation Shock. Even then, it was not reduced by much, and this chapter was followed by the Bond Market Vigilantes chapter, in which investors punished the government for its prior inflationary transgressions. In short, there is no precedent for reducing the ratio of debt to GDP by simply growing our way out of it. Instead, policy choices must be made in order to restore a primary surplus. In fact, looking at the deficit as a percent of GDP may understate the difficulty of the policy choices. Americans pay more in taxes to state and local authorities than do the residents of many other nations. As a result, the share of GDP available to be taxed by the federal government is not as high as elsewhere. In any event, in a non-recessionary economy, the federal government’s ratio of revenue to GDP is generally around 20 percent. While a $1 trillion primary deficit represents less than 7 percent of GDP, it represents about 30 percent of full-employment revenues. Eliminating a primary deficit of that magnitude will not be easy, particularly when the major expenditure components are entitlements, which are under pressure to expand rather than contract. I do not think it is overstating things to describe our current budget situation as a crisis. 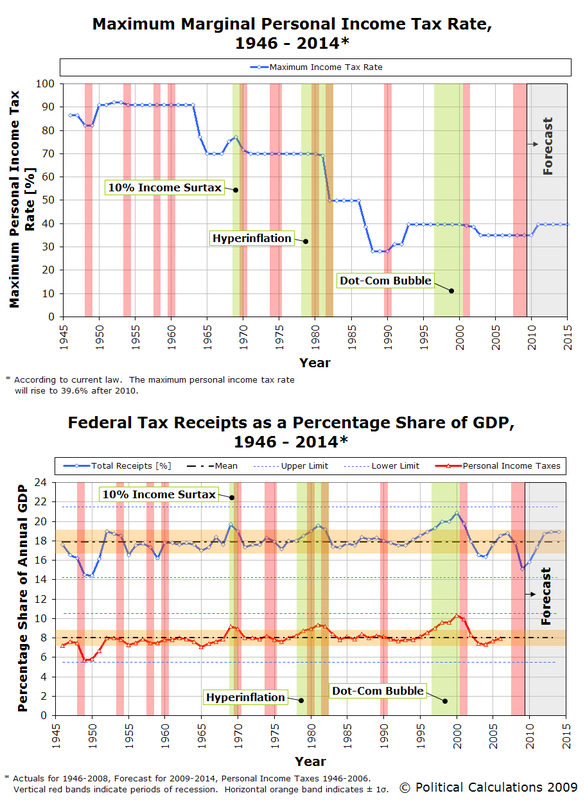 We suspect Arnold is considering more recent history in looking at the ratio of the government’s tax collections and GDP, where the Dot-Com Bubble acted to inflate tax collections in the latter years of the 1990s. Since World War 2, when the federal government transformed the federal income tax code for the purpose of extracting every penny it could from the American people to fight the war, the actual average ratio of total tax collections to GDP in the U.S. has been about 18%, which would mean that he really is understating the severity of the nation’s fiscal situation. Meanwhile, personal income tax collections have averaged a remarkably stable 8% of GDP per year, regardless of how high or low personal income tax rates have been set through all that time. And while it’s unclear whether today’s politicians and bureaucrats are capable of learning from history, we’re pretty confident that they’ll have any sustained success in trying to increase how much they collect in taxes as a percent share of the U.S. economy beyond that level, and certainly no more than their historical peers, who were some of the the most brilliant minds in government ever. The lesson to be learned by today’s politicians and bureaucrats then is that if they really want to make a positive contribution where annual deficits and the escalating national debt of the nation is concerned, they really need to focus on the spending side of the problem.